I'm a Eurogamer, but I like dungeon crawls. That's okay, right? I can like two completely different things? I play games to challenge myself, to engage my brain in solving the complex system the game presents and emerge from the experience victorious — or, if not victorious, at least feeling like I got a good mental workout and performed well in the situation. Because of this, I naturally gravitate toward Eurogames, typically known for prioritizing complex, thinky mechanisms ahead of anything else. I also just really like slaying monsters with swords and spells, though. I grew up on Dungeons & Dragons, Tolkien, and Final Fantasy. That animalistic urge to pick up a broadsword and chop a goblin in half is buried deep down in my brain. But, oh boy, if I don't hate dice. If I'm going to win or lose, I want it to happen on my terms, not the terms of random chance. I will sit down and play Dungeons & Dragons or Descent and love every minute of it, but I can never help but think that there must be something better; something with more complex, engaging mechanisms; something that gives me more control over the outcome of my actions; something that gives me an endless supply of tough decisions instead of just rolling dice over and over. I wanted to make my own dungeon crawl. I wanted to make Gloomhaven. It all started some three-and-a-half years ago. In 2013, I was still working on my first design, Forge War, but became intrigued with the card mechanisms of Sentinels of the Multiverse. I loved how each hero's deck of cards could feel so different from each other, and I wanted to try to expand that idea to a dudes-on-a-map game of tactical combat. My first pass, however, was a mess. Instead of controlling one individual character, players controlled different tribes that had anywhere from one to ten characters. This variance did indeed give a wonderfully unique feeling to each tribe, but it also made the game fiddly to an absurd degree. It also didn't help that at that point in my design career, I was dead-set against any sort of randomness in my games. So I moved on, and I grew a lot as a designer. Forge War was received well, and, in early 2015, I eventually settled on returning to this dungeon crawler as my next major design. I knew that the whole tribe-based approach wouldn't work, nor would the completely deterministic combat resolution. I needed something to differentiate the game from more basic "move and roll dice" dungeon crawlers. I didn't want each character to have a single special attack they could perform once per game. Instead, I wanted every attack to feel special and every character to feel unique. I wanted a card-based system, but was struggling with exactly how to implement it. Enter Cards Against Humanity. (You weren't expecting that, were you?) Back in 2014, they ran this sort of reality show called "Tabletop Deathmatch", and it was pretty entertaining. Not only that, but entrants on the show instilled two pretty great ideas on me that would eventually permeate into Gloomhaven's design. The first, I believe, was in reference to the deck-building game The Shadow Over Westminster. The idea was simple: Each player controlled a character running around on a map, but these characters didn't have any innate statistics written down on a card or mat somewhere. Everything that made them unique as a character was distilled down into the deck of cards the player was building. I know it's a pretty simple concept, but it resonated with me as a very elegant way to approach the idea of character statistics. The second was the idea of multi-use cards. Now, obviously, the game in question, Rocket Wreckers, did not originate the idea of multi-use cards, but the simplicity of its implementation really stuck with me. Each card has an action on it and a distance, and each round you play two cards from your hand: one for the action and one for the distance. It was simple, but it allowed for dynamic decision making. From there, the game kind of just exploded. 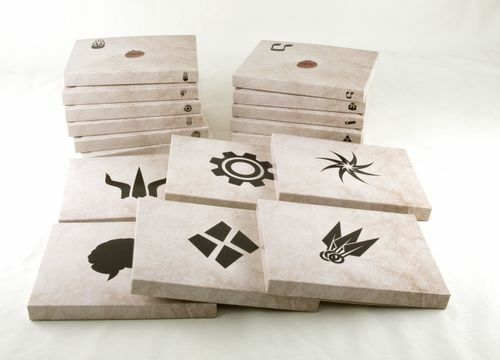 Each character could have a unique deck of cards that contained all of the various abilities they could perform. No external stats were needed aside from their hit point value and their deck size. These cards could be dual-use, so that one side contained abilities geared more towards attacking, and the other side contained movement abilities. Players would play two cards each turn, and it would simulate the basic structure familiar in most dungeon crawlers — moving and attacking — but the diversity of abilities would give each character a unique feel and allow the players lots of decisions to make on their turns. Soon after, the player order was also built into the cards by giving each one an initiative value, and, with some tweaking, the pace of the game was chained to the idea of a character losing cards over time, either slowly through resting or quickly through using super-powerful abilities or taking too much damage. Once players run out of cards, they lose. I also needed to come up with a system for enemy automation. I wanted the game to be fully cooperative as far back as the early "tribe" design, simply because if a player is controlling the monsters, they're never having as much fun. The monster automation in that earlier design, though, was easily the worst part of the game. Each separate monster had a whole slew of conditional rules about how it prioritized who to attack under various circumstances. In all my testing, I would be the one to move the monsters because I was the only one who could figure it out. My number one priority now was to make it simple, so I looked to Mice and Mystics. I always appreciated how easy its enemy activation was, so I started from there, with a monster on the board simply going after the closest character and attacking. I did have a secondary priority, though, which was to make monster behavior interesting and variable, so I decided to switch up the monsters' actions every round with a deck of cards that modified a monster's base statistic. Maybe one round a monster moves a little less than you expect, then attacks for a little bit more. Maybe another round, the monster doesn't attack at all, but simply sets itself up to retaliate if you attack it. The best thing about these card decks is that, much like the characters and their own decks of cards, you could give a monster a personality based on how it behaved. Each monster has a unique deck of ability cards, and learning and reacting to their tactics becomes part of the fun. I suppose now is as good a time as any to address the looming specter of randomness that exists with any dungeon crawl — or really any cooperative game in general. If a cooperative game is completely deterministic, it either has to be incredibly complex to hide that determinism (which is usually a disaster, as I learned in the early "tribe" iterations) or it will quickly become solvable and lose its fun. And while I have progressed far enough as a designer to know that randomness has its time and place in a game, I still can't bring myself to include dice in a design. I know that some people enjoy the activity of rolling a die, then standing up from their chair in anticipation of what the result of the roll is, but I just loathe dice. Furthermore, I am convinced that a deck of cards is a far superior random number generator due to the simple fact that a deck of cards is customizable. You can't customize a D6 without making a mess with stickers. Plus, depending on how often you shuffle the deck, it actually becomes less random than a die due to the existence of prior information. What was important at this point is that I had a really fun dungeon crawler. Like I said, after the initial innovations with the card play mechanisms, it just exploded into this highly enjoyable system — but that wasn't enough for me. Not by a long shot. With the early "tribe" iterations, I was content to use the system to create single, independent scenarios. You head into a dungeon with your friends, kill the monsters, and that's the whole game. 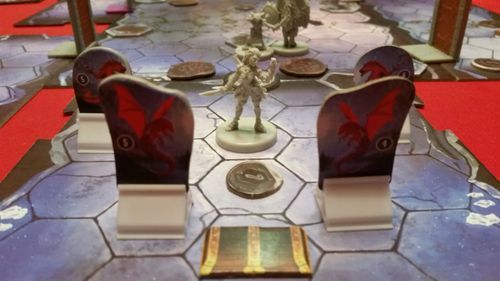 By the time the newer Gloomhaven system was in full swing, though, I had experienced the campaign play of Descent and knew there was something much more epic to be done. The game play of Descent is fairly basic, but the campaign aspect — stringing scenarios together and accumulating items and advanced abilities to face harder monsters — was scratching an itch I didn't realize board games could scratch. And once you start scratching that itch, you don't want to stop. As I said at the beginning, I am a huge fan of role-playing games, and the idea that a structured board game could emulate a full Dungeons & Dragons campaign or an Elder Scrolls game was something I was desperate to explore. I wanted to see how far I could push it. I wanted to build an entire world that would feel expansive and open and would actually react to players' choices. It should be stated up-front that I didn't start this journey trying to make a legacy game. To me, legacy is simply the concept of altering components and revealing new components over repeated plays, and, like any other game mechanism (such as deck-building or worker-placement), it has the potential to enhance a game play experience when used the right way. I don't think a designer should sit down and say, "I want to make a legacy game," any more than I think they should sit down and say, "I want to make a deck-building game." Use the mechanisms where they fit to make your core game a better experience. 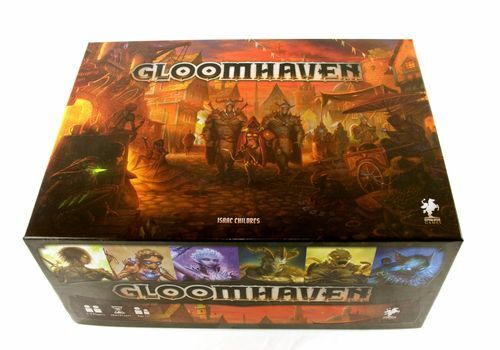 To dismiss Gloomhaven as a legacy game is highly reductive and narrow-minded. Gloomhaven is a tactical dungeon crawl with an open and expansive world. Because it is so expansive, however, I felt using some legacy mechanisms was the best way to deliver it to players. If I wanted players to keep coming back week after week to play my game, I had to give them something to work towards. There had to be a sense of discovery to the game, hidden parts that would reveal themselves over time. The most straight-forward example of this are the locked character classes. There are six character classes players can use when they first open the box and another eleven that can be played only once specific conditions are fulfilled. Maybe seventeen classes was a little overboard for a single box, considering each one has a unique deck of around thirty ability cards, but I love them all, and it definitely feeds into the concept of a giant, unexplored world. All seventeen of these classes could be available from the start, but then you are front-loading the joy of discovery. The best feeling in the game is opening one of those character boxes and seeing what amazing creature is waiting for you inside. It is a major incentive for players to keep coming back for more. The progression of an individual character is also a massively exciting part of any campaign game. It's hard to call this "legacy" as the idea of character progression has been around for ages, but it is still an important part of that persistent, ever-changing nature of the game. Since it has been around for ages, though, there weren't too many innovations here. Players get money, then they buy equipment that helps them kill stuff better. They gain experience and level up, which gives them access to cooler abilities, more hit points, and the opportunity to customize their attack modifier decks. (I told you I'd come back to this.) This modifier deck customization is the secondmost exciting part of character progression to me because, as I said above, it is not something you can do very well with dice. Your deck starts out as a D20, but then you start taking out bad cards, adding good cards, and it quickly becomes something impossible to represent with any number of dice. The most exciting part of character progression, though, is the fact that characters retire and get put back in the box. As soon as you create a character, you draw a "personal quest" — a long-term goal that represents the character's sole reason for becoming a mercenary in the first place. When a character completes this quest, they are forced to retire, and this is what unlocks new character classes to be played. This whole concept was born from the fact that I wanted the game to be big. Sure, playing a single character is exciting and fun, but there are so many characters in the box and players are going to be itching to play something new long before they've fully explored the campaign. I wanted this switch from one character to the next to be represented in the mechanisms, so retirement was created. The other incentive here is that a personal quest gives each character an official story arc. Since the campaign world itself is so big and open, I wanted the narrative to be more focused on the characters than on some over-arching epic plot of world-ending evil. Sure, there is an official ending scenario that players will reach, and the stakes are sufficiently high, but I didn't want players to feel like that was the point of the game. There will be plenty more of the world to explore even after the "end boss" is killed. 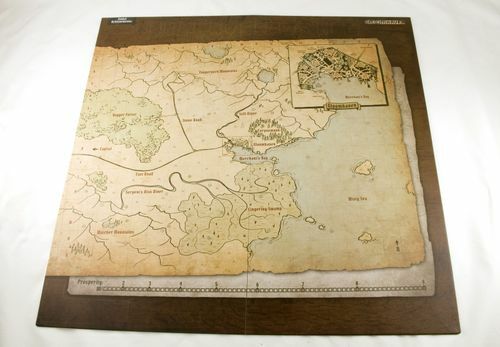 Which brings me to the next legacy aspect of the game: the actual map board, a visual representation of both the world that you inhabit and the scenarios that are available to play. The idea here is that this is not a linear campaign. It is a sprawling world full of side-paths and branching story threads that opens up the more you play. I wanted to capture that feel of playing an Elder Scrolls game. You're heading off to a mission when you see some strange cave in the distance. You head over to it, either to explore it immediately or maybe just to mark it on your map so you can explore it later. Even with all the twists and forks in the story, I'm sure there were other ways I could have created a system to visualize what scenarios were available to your party at any given time, but I don't think any could be more engrossing or visually appealing than a nice, big board full of stickers. The world starts as a blank canvas, and, as you play, you slowly start to color in the details, which is something I find incredibly exciting. The last major persistent part of the campaign are the event cards. I think this was one of the last mechanisms to be implemented, and they emerged as a way to add even more color and immersiveness to the world. I wanted to give the players more choices and give the world more opportunities to react to those choices. Every time players return to town or head out on the road for a new adventure, they draw an event card that gives them a little story, then a binary choice to make. Once the choice is made, the card is flipped over and the consequences are revealed. This is a very simple mechanism, but it allows for a huge number of opportunities to make players feel like they are playing in a living, breathing world. Players will develop a reputation which will then have an impact on the outcome of events. Completing certain quests may cause cards to be added to the event decks, giving the world a chance to react to the players' deeds. Retiring characters will also add cards, meaning that players may run into their old party mates later on down the road. I definitely drew inspiration from Robinson Crusoe here, with the idea that choices you made in events may affect what happens in your game later on. It's just great storytelling, and I'd be a fool not to use it. In the end, I never intended to make a 21-pound game. I intended to give players a complete world to explore, and those 21 pounds were just the natural progression of that concept. I let the story grow and expand to fill in all the cracks of the world, and I ended up with 95 separate scenarios. To fill in those scenarios, I needed a plethora of map tiles and terrain features, in addition to an expansive bestiary of monsters to make sure the game never felt repetitive. I ended up with 36 different monster types, plus thirteen unique bosses. Add in the seventeen character classes — every exciting and unique character idea I could come up with, each with their own player mat, character sheet, miniature, and decks of ability cards and modifier cards — and, well, all that card stock and cardboard started to add up. I could not be more proud of how it turned out, though. I feel like I have delivered on my vision, and now I eagerly wait to see where my 21-pound baby goes from here. The game was designed to make additional content easy to create, so I am looking forward to seeing what unique scenarios the community creates from the core system and how the world will continue to expand and grow from here.